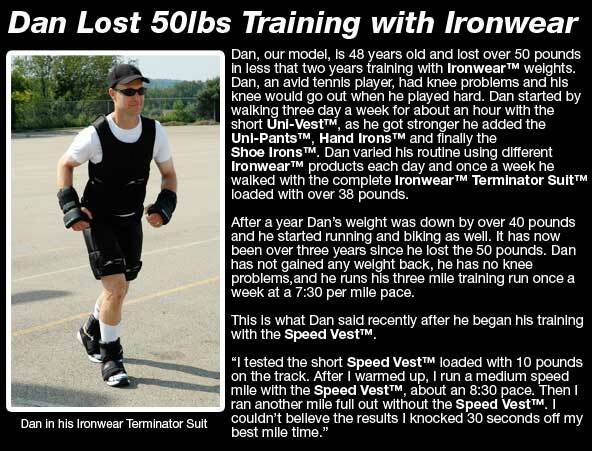 The New Speed Shoe Irons™ are the latest design of IRONWEAR®'s revolutionary new patented exercise tools. The New Speed Shoe Irons™ are part of IRONWEAR®™ Speed Line of high performance weights and are designed to go fast and stay in place. 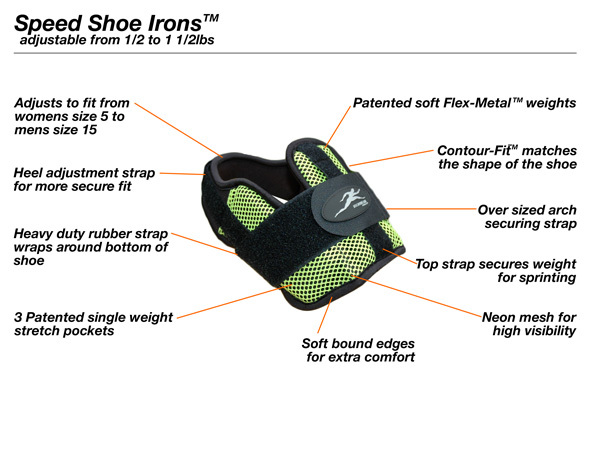 The New Speed Shoe Irons™ each have 3 individual mesh weight pockets that are designed to only hold one ½ lb. Flex-metal® weight per pocket, the tight pocket design prevents any movement of the weight. (Champion, Cool and Club Shoe Irons™ have weight pockets that are slightly larger so that they can stretch to hold up to two weights per pocket). The New Speed Shoe Irons™ are made of high strength large cell mesh to match the rest of IRONWEAR®'s Speed Line of products and to allow the maximum amount of airflow to maximize heat extraction. The New Speed Shoe Irons™ use IRONWEAR® Flex-metal® technology to produce the first and now even better high performance shoe weights. The New Speed Shoe Irons™ use soft flexible Flex-metal® weights that conform to the shape of your shoe and are held securely in place by IRONWEAR®’s latest proprietary strapping system. The New Speed Shoe Irons™ have multiple securing systems to hold them in place during the most rigorous workouts. First, the heel strap is stretched over the heel, then the tightening strap locks the heel strap in place. Second, the sole/arch strap system holds the weights firmly against the top of the foot above the arch. The sole/arch strap system is very adjustable and easily removable. The sole/arch strap allows the weights to be properly positioned and secured on a wide variety of shoe sizes and designs. The sole/arch strap goes under the sole of the shoe and wraps around the shoe to attach to the side of the Speed Shoe Irons™. The arch strap then goes through the arch top loop on the top weight pocket and connects on the other side through a rectangular ring. Once through the ring, the sole/arch strap can be tightened to hold the Speed Shoe Irons™ firmly in place. The Speed Shoe Irons™ sole/arch strap is removable so that it can quickly and easily be replaced if it gets worn. 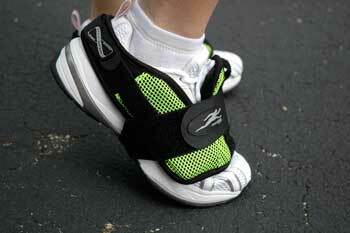 The sole portion of the sole/arch strap is designed to fit into the arch area of the athletic shoe. If the shoe arch area is high, the sole/arch strap should last for years. If the sole of the shoe is flat, then the sole area of the strap may contact the ground and wear out over time. The sole area of the strap is constructed of heavy duty woven nylon webbing for maximum strength and durability. 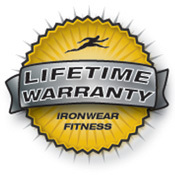 If the strap becomes worn, a new strap can be purchased from IRONWEAR® and replaced in a few seconds. The New Speed Shoe Irons™ are more comfortable and secure than ankle weights. IRONWEAR®'s unique design stays in place even during the most rigorous exercises. Unlike ankle weights, the New Speed Shoe Irons™ do not chafe, inhibit or interfere with your movement. 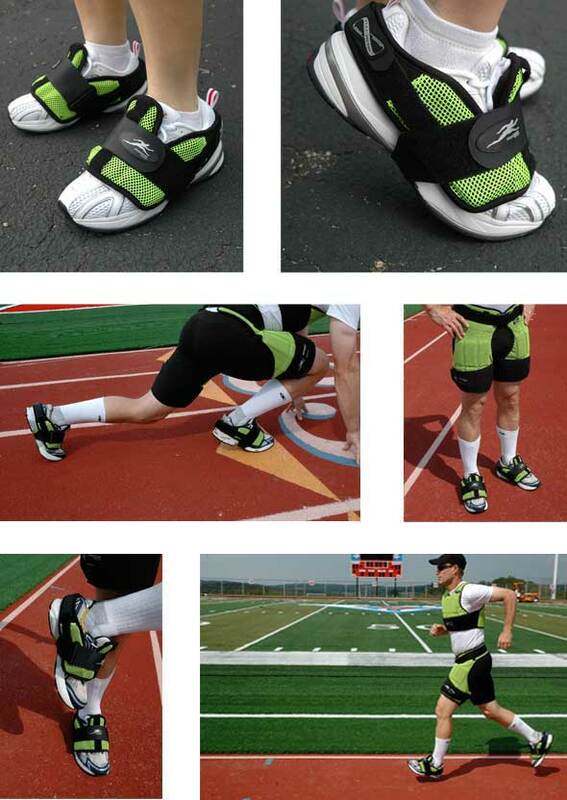 Ankle weights tend to move up and down while you run and cause a jarring action when they bottom out against the foot. The New Speed Shoe Irons™ do not jar your stride like ankle weights. This is because the weights are located above the ball of the foot and impact the ground at the same time as the ball of your foot. In addition, there is no sliding action as there is with ankle weights. The New Speed Shoe Irons™ are do not jar you or your stride like ankle weights. This is because the weights impact the ground at the same time as the ball of you foot. In addition there is no siding action as there is with ankle weights. The New Speed Shoe Irons™ position the weight farther from the knee and hip so less weight is required for the same effect. For example a 1.5 pound Speed Shoe Iron ™ is equivalent to a 2.5 to 5 pound ankle weight for most exercises. The New Speed Shoe Irons™ are designed for intense training and faster feet. No other shoe weight can be used for more intense exercises or do what these weights can. The New Speed Shoe Irons™ fit most adult athletic shoe styles and sizes from size women’s size 5 up to a man’s size 15. Simply loosen the straps and slide it over your shoe, tighten the heel straps and then oversized sole/arch securing straps and you are ready to go fast. The New Speed Shoe Irons™ are adjustable in ½ pound increments from ½ to 1½ pounds per foot and are supplied with 3 - 1/2 pounds weights (1.5 pounds) per foot.